The Closed Joint-Stock Society "Centrpribor" is manufacturer and supplier on ultrasonic flow meters successful in measuring all types of liquids including water, hydraulic oil, condensate, petroleum products, natural gas and many others. 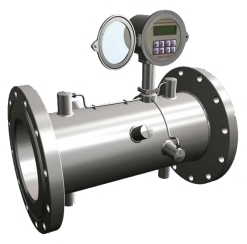 JSC Centrpribor is patent owner of №16882-97, Russian Pattern approval certificate of measuring instruments on the flowmeter UFM-005, the liquid counter AC-001, the oilmeter "Centrosonic" for oil and oil products, natural gas flowmeter "Goboi". 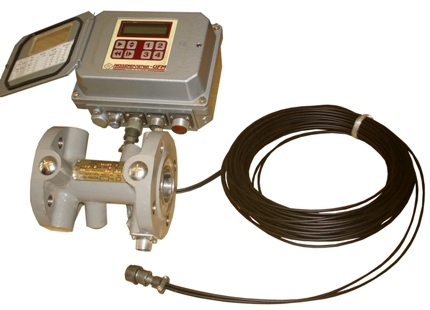 All of our flowmeters are spoolpiece mounting type. Spoolpiece ultrasonic flowmeters consist of a section of pipe with the transducers - two piezo crystal sensors - mounted in pipe). The transit-time differential method is used for measurements of flow by sending bursts of signals through a pipe . The method is based on the principle that sound waves travelling in the direction of flow of the fluid require less time than when travelling in the opposite direction. At zero velocity , the transit time or delta T is zero. If we know the diameter of the pipe , the pipe wall thickness and the pipe wall material the angle of refraction can be calculated automatically and we will know how far apart to space our transducers. For UFM 005 flowmeter an optional dual-channel (dual-path) model can be configured for a variety of uses including flow measurement in two different pipes, leak detection by measuring at two different locations on the same pipe and dual-path measurement at one location for maximum accuracy. -Crude oil flow measurements on oil rigs .